The members of the Security Council condemned in the strongest terms the attack against the United Nations Interim Force in Lebanon (UNIFIL) on 4 August near the town of Majdal Zun, Southern Lebanon. Peacekeepers were threatened with illegal weapons, vehicles were set on fire and UNIFIL’s own weapons and equipment were seized. The members of the Security Council underlined the need for the conduct of a credible investigation to determine the exact circumstances of this attack. The members of the Security Council reiterated their full support for UNIFIL, condemned any attempt to prevent UNIFIL from carrying out its mandate in full in accordance with Security Council resolution 1701 (2006), and recalled the necessity for all parties to ensure that UNIFIL personnel are secure and their freedom of movement is fully respected and unimpeded. 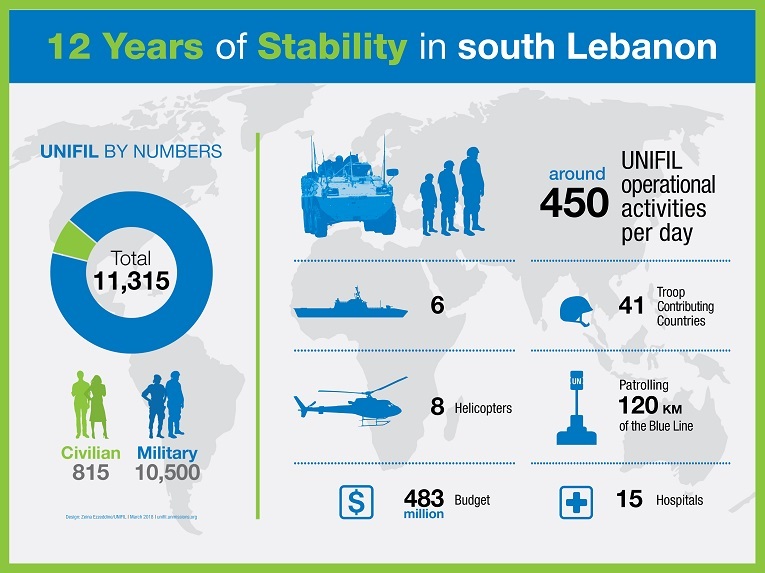 The members of the Security Council commended the role of UNIFIL in maintaining calm along the Blue Line and its cooperation with the Lebanese Armed Forces (LAF) with the aim of extending the control of the Government of Lebanon over all Lebanese territory. The members of the Security Council recalled the statements of the International Support Group on 8 December 2017 and of the Security Council on 19 December 2017 and 27 March 2018, commending the role of the LAF and of all state security institutions in protecting the country, its borders and its population, and recalling that the LAF are the only legitimate armed forces of Lebanon, as enshrined in the Lebanese Constitution and Taif Agreement. The members of the Security Council recalled relevant provisions of Security Council resolutions 1559 (2004), 1680 (2006), 1701 (2006) and 2373 (2017), including provisions that there be no weapons or authority in Lebanon other than those of the Lebanese state, no foreign forces in Lebanon without the consent of its government, and no sale or supply of arms-related materiel to Lebanon except as authorised by its government. The members of the Security Council encouraged the Secretary General to continue providing prompt and detailed reporting on restrictions to UNIFIL’s freedom of movement. The members of the Security Council reaffirmed their commitment to the stability, security, sovereignty and political independence of Lebanon, in accordance with relevant Security Council resolutions.